With the economic situation in Vietnam deteriorating by the day, it is only natural that investors have concerns over the fate of Malaysian businesses in the country. Similarly, against the backdrop of such uncertainty, even Malaysian companies are holding back on their projects in Vietnam, says an analyst with TA Securities. Vietnam’s economic growth slowed to 6.2% for 2008, its weakest since 1999 largely attributed to lower demand for exports as recession hit the US, Europe and Japan last year. “Basically, it is good that they should hold back first, given the situation in Vietnam. “They are facing a high interest rate environment and growing economic pressure on demand, even though input costs have come down,” says the analyst. Construction and property development costs are generally considered to have come down with the bursting of the commodities bubble since the middle of last year. As for potential losses to Malaysian developers and construction players, “the amount committed so far is not large. Losses would be minimal,” the analyst adds. The analyst, who covers WCT Bhd, SP Setia Bhd and Gamuda, also points out that many Malaysian companies have not begun work on any projects in Vietnam as they are held back by the global economic crisis. He says in his coverage that only Gamuda Bhd has commenced infrastructure work on the RM8bil Yen So Park project. 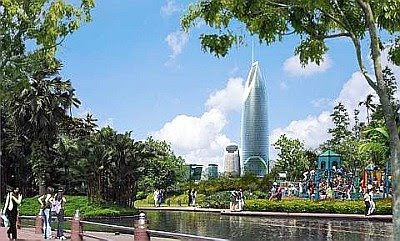 The Yen So Park lake-side project in Hanoi covers 130.8ha that will include a five-star hotel, an international convention centre, offices, apartments, luxury condominiums and villas, a recreational club, community facilities and a botanic park. Responding to StarBizWeek queries, Gamuda says there has been no further change in the company’s operations in Vietnam. Last month, Gamuda announced that it would maintain the total value of its projects in Vietnam at RM10bil. However, it added that the financial crisis and investors’ difficulty in getting funding might delay the development of the retail mall, office block and hotel parcels for one or two years. It pointed out that although the project was scheduled to run for 12 years, the delay would not be significant. Berjaya Land Bhd which has received investment licences in Vietnam for four projects covering 920ha, expects some slowdown in demand for properties there and is prepared to defer projects. Even so, Berjaya Land aims to launch the first phase of its Thach Ban project in Hanoi by the second half of 2009. Thach Ban City in Hanoi is the company’s maiden project in Vietnam comprising 148 units of condominiums worth a total of US$550mil (RM1.97bil). Ng adds: “We have started work on our Dong Nai Residential Development project, and are also planning to launch it in the second quarter of 2009. “We believe that once the global economy has stabilised, the take-up rate for property will improve. Berjaya Land currently has no contribution from its overseas projects in Vietnam as it only entered the market in the last two years. The company has a target that all its overseas property development ventures will contribute some 30% to group revenue in three to four years. 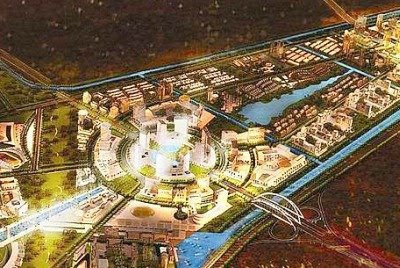 Currently SP Setia, which has one ongoing project in Vietnam and another in the planning, says there would be no change in schedule and it was going ahead with the development. Its on-going project is the 226ha township EcoLakes at My Phuoc, Ho Chi Minh City in a joint venture with Vietnam’s state-owned conglomerate, Becamex IDC Corp. The project in planning is called EcoXanh, (meaning “Eco Greens”) which will be a range of villas with club house facilities on 31.6ha in Ho Chi Minh City. EcoXanh is a joint venture between unit Setia Saigon East Ltd and Saigon Hi-Tech Park Development Co.
Tan Sri Liew Kee Sin, group managing director of SP Setia says: “We are going ahead. Where EcoLakes is concerned, our show village is almost ready and should be launched in the first quarter of this year. SP Setia says it is confident its ideas will take off in Vietnam, despite the current economic turmoil. “We feel that the sub-urbanisation of housing and offices is inevitable given the congestion, inadequate infrastructure, cramped living quarters and expensive office space in central cities like Ho Chi Minh City and Hanoi. “In this sense, we feel that SP Setia has a distinct advantage in Vietnam as building sub-urban townships is our forte,” he adds. At present SP Setia’s revenue solely comesfrom the domestic market. Main board-listed Ireka Corp Bhd’s exposure to the Vietnam market is mainly through its 19.6% stake in London-listed Aseana Properties Ltd as well as the appointment of wholly-owned subsidiary Ireka Development Management Sdn Bhd as the exclusive development manager for Aseana. The successful London-listing of Aseana in April 2007 was initiated by Ireka. In mid-2008, Aseana received investment licences for Queen’s Place (formerly known as Horizon Place) and International Hi-Tech Healthcare Park in Vietnam; both are mixed developments with residential component. Queen’s Place will cover 8,400 sq m adjacent to the central business district in Ho Chi Minh City and the Hi-Tech Healthcare Park will be a fully integrated “Medical City” with approximately one million sq m of gross floor area. Meanwhile, all of Aseana’s other pipeline projects in Vietnam are still at the master planning and approval stages. Ireka Development president Lai Voon Hon says: “This includes Wall Street Centre (District 1, Ho Chi Minh), Nam Khang Resort & Residences (Danang) and One Saigon. “In July last year, Aseana also acquired a strategic stake in Nam Long Corp, one of Vietnam’s leading property developer with over 500ha of land bank in Ho Chi Minh City and neighbouring provinces. On the company’s outlook for Vietnam, he says: “Vietnam is frequently compared to China of a decade ago and therefore is thought that the current challenging environment mirrors that of China in the mid-1990s. This is as a result of rapid growth, in which there is bound to be a reactionary correction but eventually will be followed by stabilisation and growth. That pretty much sums up most Malaysian companies’ aspirations in their Vietnam ventures. DESPITE the gloom and doom encompassing much of the global economy these days, there are still good opportunities for cash-rich entrepreneurs and companies looking for value acquisitions. As a more meaningful recovery of the local economy and property market will only become more evident around year-end or in early 2010, most developers will be consolidating their positions to get ready to ride on the next wave of growth. Companies with strong balance sheets and cash reserves should look out for the right opportunities to snap up good quality assets, both within and outside the country, that may be available at more realistic prices now. Besides local opportunities, companies should also look to the global market and consider investing in assets overseas for a wider geographical expansion as it would cost less to do so now. Companies that have laid the groundwork by building up a pool of top-notch management and technical capability, internal processes, and financial resources should take advantage of the current slowdown to further enhance their areas of competency. Regional markets like Singapore, Vietnam, India and China have much to offer investors as asset values have eroded by 20% to 30% since they succumbed to the contagion effect of the global financial meltdown. According to the latest market report on Singapore by CB Richard Ellis (CBRE), out of 2,200 units in luxury projects that were launched in the city state between 2006 and 2008, 55% or 1,204 units remained unsold as of last November. The average launch prices of new luxury condominiums fell from a range of S$2,000-S$4,000 per sq ft (psf) in the last quarter of 2007 to S$2,000-S$2,600 psf in the fourth quarter last year. CBRE is projecting a 10% to 15% fall in prices of existing projects this year. That means retail property buyers can also look around for some value buys. Vietnam, which is still reeling from the effects of an overheating economy and high inflation in the first half of last year, also offers good potential for some good cherry picking. Companies with strong net cash position such as YTL Corp Bhd has already started shopping around for distressed assets. With its war chest of more than RM10bil cash, YTL Corp is making great headway in the construction, property and infrastructure sectors in Malaysia, Australia and Britain, via acquisitions. Last October, the company agreed to pay S$285mil for control of Macquarie Prime Real Estate Investment Trust (MP REIT). With the price at a 49% discount to the net asset value, the proposed acquisition of MP REIT will provide stable earnings and good upside potential to the company. By having a REIT in Singapore, YTL will be well placed to tap the city-state’s expanding real estate sector and promote its Starhill brand in the international market. A consolation for local property players in the current challenging market is that their low gearing position and prudent financial management will likely pay off and enable these companies to ride out the current downcycle. In fact, a number of property companies have net cash reserves to expand their landbank and pick up some value assets. As the saying goes, “Every cloud has a silver lining.” While developers have been forced to review and delay project launches, the market slowdown also offers them the chance to consolidate and identify new opportunities to thrive when the good times return. # Angie Ng is deputy news editor of The Star and she believes with right planning and foresight, developers will be able to ride out the tough times. Both are components of the commercial real estate business and neither will escape the pressures of the economic slowdown, but the performance of office space and retail space in the coming months will also depend on a few factors unique to each segment. For one thing, office space may not do well if many companies opt to stay put instead of shifting to larger and better premises. In retail, occupancy depends significantly on the growth strategies of the business operators, and the kind of products and service they sell. Regroup Associates executive chairman Christopher Boyd says the Malaysian commercial property market will remain quite competitive this year as the take-up of new space is expected to be affected by the global financial crisis. “We have already seen a lot of potential tenants saying they would like to wait and see. With so much uncertainties in the world, companies will play safe and defer any decision to move if they can avoid it,” he told StarBizWeek. Boyd says it costs about RM100 per sq ft to fit out an office. This is a big commitment. For example, a 5,000 sq ft office may require about RM500,000 just for the furniture and fittings. “The poor sentiment will lead to weaker demand for commercial space. The asking rentals will probably weaken but there isn’t going to be a crash because supply is fairly tight,” he adds. However, he believes that international companies that are looking for a lower-cost environment will still choose Malaysia because the rental rates are still low as compared with those in other parts of the region. “Businesses like service centres and back-office services might decide to come to Malaysia simply because of the low rental rates,” he says. According to Boyd, this year alone, 10 new buildings in Kuala Lumpur will be completed, thus adding to the market a total area of about 3.4 million sq ft.
“However, approximately half of these building will be pre-let, like the SSM building, Menara Bumiputra Commerce and MIDA building. The available space to let is actually about 1.9 million sq ft only,” he says. Among other buildings available for lease this year are G Tower, KL Pavilion, Menara Worldwide and Towers B, C and D of KL Sentral. 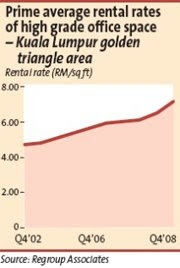 He says the average rental rate for Grade A buildings in the Golden Triangle is currently at about RM7 to RM9 per sq ft.
On the outlook for the retail sector this year, Regroup Associates managing director Allan Soo says the market has dipped since the third quarter of 2007. “Although companies like Parkson, Jaya Jusco, the hypermarkets, and some local fashion operators and food retailers seemed to be doing well until the third quarter, they all faced business decline by the fourth quarter,” he adds. Everybody agrees that the fuel hike last June has affected sales. “In most cases last year, there was a sales drop of about 5% to 10%, while the drop for some higher-end fashion brands was about 10% to 30%,” says Soo. However, he reckons that the hypermarkets will keep faring well because people still need to shop for groceries. Their margins may narrow because of price competition, but the total sales volume should increase. More hypermarkets will open this year to cater for the demand for bargains and lower-priced goods. Soo says there will be 1.5 million sq ft of additional retail space this year and it will badly affect the market. He points out that there is already about 39 million sq ft of retail space in the Klang Valley. The new properties will increase the available space by 3%.” The new malls will be much smaller and are mostly located in the suburbs. “By 2010, the incoming supply of retail space will drop to 1.7 million sq ft from the proposed 3.4 million sq ft. This is good news for the industry, for that avoids an oversupply of space,” he adds. Some of the planned projects are put on hold. “Based on our survey of 13 shopping centres, the occupancy rate is still stable. We foresee some people closing their shops but it will be very limited,” he says. DTZ Nawawi Tie Leung Property Consultants Sdn Bhd director Adzman Shah Mohd Ariffin says some mall operators will start looking seriously into repositioning their properties. The aims are to remain competitive, attract more shoppers and retain tenants. “Well-located and well-managed malls will continue to do well in weathering the downturn. More spending on advertising and promotion activities will have to be carried out to attract or at least, retain shoppers,” he adds. He, however, cautions that mall operators should be prepared to come up against stiff resistance should there be any attempt to raise rental rates after the Chinese New Year. Some tenants have begun to consolidate and downsize to reduce operating expenses. Although lower growth and sales are expected, retailers are more prepared now than in previous downturns, to revise their sales projections. They may want to consider moving to new locations to achieve better market penetration. The building owners and managers are somewhat more upbeat. Joyce Yap, president of the Malaysian Association for Shopping and Highrise Complex Management, says the outlook for shopping malls this year is still vibrant despite the slowdown. “Though people are a bit cautious, the traffic flow at the malls is still strong,” she adds. As she points out, shopping is a way of life among Malaysians and they will still go to the malls even in these tough times. She says good shopping centres will still record good occupancy rates, such as Pavilion in Kuala Lumpur, which is 100% occupied. She believes that shopping centres that will be ready this year will survive although they have to face more competition from the existing complexes. “However, malls that have still some way before completion will face tough times ahead to fill the space as retailers are now more cautious and are putting their expansion plans on hold,” she contends. Yap says shopping malls that are located in the city centre will still be attractive, especially among the tourists, and can benefit from their spending power. “The ones that are located in the suburbs will face difficulty in boosting sales,” she adds. Berjaya Land Bhd chief executive officer Datuk Francis Ng agrees that the current economic situation will dampen the demand for commercial properties. “Purchasers are exercising more caution and we expect the market to be soft during this period. However, we believe that once the global economy stabilises, the take-up rate for commercial property will improve,” he told StarBizWeek in an e-mail. Boustead Curve Sdn Bhd director Datuk Ghazali Mohd Ali says the company’s shopping mall, The Curve at Mutiara Damansara, Petaling Jaya, is still doing very well, with existing tenants eager to expand their businesses. This is a good sign that their businesses are doing well, he says, adding that the mall’s occupancy rate is about 98%. Over the past several months, there have been at least 10 aborted deals in some form or the other. Some of them were biggies like Menara Citibank in Jalan Ampang. Others may be considered just a scratch, but no less interesting, involving land and old buildings. Among them is Bok House, built in the 1880s, in Jalan Ampang. At one time it was known as Le Coq Dor, where English tea and scones were served. Will this be the way to go for the rest of the year? Consultants are reluctant to say what’s coming simply because they don’t know. “We don’t even know what’s going to happen next week,” one of them says. Instead, they prefer to wait until after Chinese New Year, and after that the transition period when Deputy Prime Minister Datuk Seri Najib Tun Razak takes over the premiership in March to see what sort of policies he will unveil. What precipitated the slew of aborted deals? YY Lau, executive director of YY Property Solutions Sdn Bhd says business uncertainty became an issue overnight. Lau: Some of them feel they are able to get better pricing if they wait a little. All of a sudden, the scene appears to have changed. The US sub-prime issue imploded in the first quarter of 2007. We in Asia took little notice, until the fall of Lehman Brothers and reality set in. Lau says another reason why deals were called off was the hope for better pricing later on. “Some of them feel they are able to get better pricing if they wait a little longer,” says Lau. Consultants and developers say they have been getting calls from clients and friends, asking whether there are any “fire-sale”. The answer is no. A third concern is financing. Although commercial banks say they have not unplugged this channel, consultants say the margin of financing has dropped. If banks were prepared to lend 80% for the project, now they are looking at 70%, they say. The fourth reason has much to do with sentiment and confidence, or lack of it, as echoed by three consultants – Lau, Jerome Hong, managing director of PA International Property Consultants (KL) Sdn Bhd, and C H Williams Talhar & Wong Sdn Bhd (WTW) managing director Goh Tian Sui. Goh: There are various issues to be handled at home. These, he says, have dampened sentiment. A factor to note is the entry of foreigners, particularly from the Middle East, South Korea and Singapore, who have entered the local property market in a significant way in recent years, snapping up commercial properties and some others, as developers. Assuming they have, thus far, merely forked out 10% or less, chances are they may choose to forfeit the sum rather than move ahead with the project if they feel that it is in jeopardy or may not be a sound investment any more. When things turn sour back home, it is logical for them to liquidate here to move their money home, says Lau. And this may be what is happening in some of the projects in Ampang and U-Thant area where South Korean developers have gone into niche developments. Some of the aborted deals involve condominium projects in the city centre. With so many condominiums in the market, developers are beginning to doubt the viability of adding to the swelling numbers, hence aborting the purchase to avoid holding costs. But generally, it is not a single factor but a combination of reasons that lead to the decision to scrap the transactions. “The property market is not dead. Deals are being done. It is just slow due to the various festivities and December and January are generally slow months; but this time, it is slower than usual. And compared with the past crisis, there appears to be more aborted deals. Hong: The property market is not dead. It is just slow. “Companies and businessmen are reassessing their position with property not being the flavour of the month. Cash is. This first half will be crucial as everybody adjusts to the situation,” says Hong. The deal: Vendor terminated an agreement to dispose of a piece of freehold land in Jalan Yap Kwan Seng, Kuala Lumpur for RM84.3mil. Reason: Magna’s failure to make payment. Magna paid KCB RM8.43mil in damages. The deal: Axis REIT proposed to acquire two factories in Jalan Seelong in Senai, Johor for RM27mil. Reason: Unfulfilled conditions precedent in the sale and purchase agreement as at the expiry of the conditional period. The deal: F&N accepted an offer to purchase a site for Ampang Hilir 233 Condo but the offer was terminated on Nov 3, 2008. Reason: Land Office acquired an additional 24 sq m (0.4% of total net area) of the project site and the buyer exercised the right to rescind the transaction following the acquisition notice. F&N refunded the deposit. The deal: Buyer to take over 8.78 acres within Kenny Heights. Reason: Certain conditions were not fulfilled within the agreed timeframe. Another letter of intent for a joint venture between DutaLand subsidiary and Merrill Lynch (Asia Pacific) Ltd to develop 16.2 acres within Kenny Heights also lapsed. These two terminated JVs constitute two of nine parcels under the 88-acre Kenny Heights development, scheduled for completion in 15 years with residential and commercial portions accounting for 30% and 70% of the total estimated built-up area of 23 million sq ft.
An official statement from developer DutaLand said the freehold Kenny Heights projects will continue with Phase 1 having been successfully launched through private events and roadshows in Kuala Lumpur, Singapore and Hong Kong since April and the official launch in November 2008. Reason : IOI Corp forfeited its deposit of RM73.36mil when it decided not to proceed with the proposed acquisition “due to the recent sudden adverse developments in the global economic environment which have spread to this region and impacted negatively on business sentiments”. The deal: Sunrise to sell a commercial space (comprising retail, office and car parks) and unsold serviced apartments within the project known as Mont Kiara 20. Reason: Both vendor and buyer decided to mutually terminate the put and call option agreement which involved RM767mil worth of properties, one of the largest deal to be aborted thus far. The deal: To sell and lease back a shoplot in Summit City USJ (36,361 sq ft) by the AM ARA REIT group for RM8mil. Reason: The intended objective of the joint venture was unlikely to be achieved due to a change in the conceptual plan for the proposed development.